Reviewed by Catherine Shaffer, Ph.D.
Chromatography (from the Greek words chroma, "color," and graphein, "to write") is a method for the separation of a mixture. In simple terms, the process involves dissolving the mixture in a fluid (mobile phase), which is then passed through another material (stationary phase). During this process, the constituents of the mixture travel at different speeds, resulting in the separation the components. There are different types of chromatography, depending on the shape of the stationary phase (e.g., column or planar chromatography), the physical state of the mobile phase (e.g., gas or liquid chromatography), or the mechanisms of separation (e.g., ion-exchange or size-exclusion chromatography). The purpose behind a chromatography approach may be analytical or preparative. In analytical chromatography the purpose is to separate the components of the sample. Here we focus on analyzing a substance in detail and gathering information about it. This in turn can provide a qualitative profile or fingerprint of the sample. 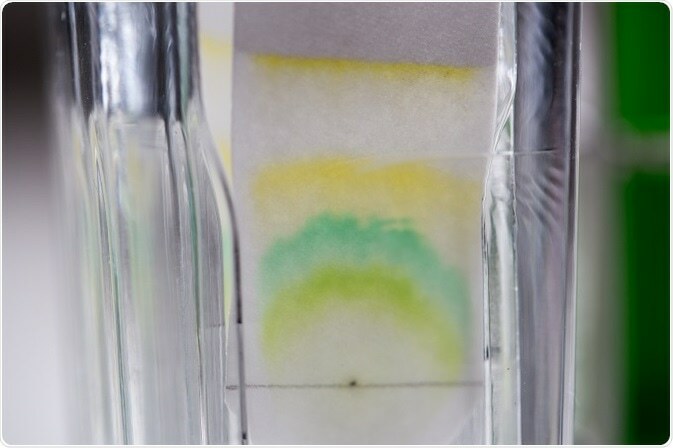 The purpose of preparative chromatography, on the other hand, is isolation and purification of reasonably sufficient quantities of a specific substance from the sample. Recovery of a substance in as pure a manner as possible is the goal of preparative chromatography. In analytical chromatography, the eluent (mobile phase) passes out as waste, but in preparative chromatography, the eluent is passed on to a fraction collector. The two basic types of chromatography make possible precise separation, analyses, or purification of substances from highly complex mixtures, the components of which can sometimes be collected individually or subjected to further "downstream" processing. The methods of separation and the parameters used in analytical chromatography can be scaled up for preparative chromatography. The two techniques are complementary, one providing a fingerprint and the other providing a method of purification. Also, the two are not mutually exclusive. Mixtures subject to separation may be aqueous (i.e., soluble in water), or nonaqueous (i.e., soluble in oil, paint, or similar solvents). Some samples, soils, sediments, tissue extracts, foodstuff, and plastics, may be solid or semisolid substances that are not soluble in water or other solvents. Still others may be air samplesor vapors. The specific type of chromatography (column, gas, of liquid chromatography) and mechanism of separation (ion-exchange, size-exclusion, expanded bed adsorption chromatography) chosen will depend on the sample at hand. Although precision, accuracy, and sensitivity are important considerations in an analytical process, reproducibility and robustness are additional factors to be considered when looking at chromatography as a packaged product. When the focus is on the preparative aspects, the requirements are product recovery, purity, and costs (in terms of scale up, throughput, and speed). For large-scale preparations, various parameters connected with sample injection, vaporization of the sample, loading capacity of the system, splitters, detection systems, and collection systems are features that would have to be considered. Optimization of these parameters have paved the way for a chromatography-specific manufacturing industry. The application potential of these techniques is so vast that there is a research and product development industry devoted to the study and optimization of batch processing, continuous simulated moving bed processing, column equipment and related technology. Others work on developing better stationary phases, regulatory issues in chromatography, and membrane chromatography. There are periodic exhibitions and demonstrations that showcase solutions to common chromatographic separation problems, together with related equipment, process optimizations, and cost minimization. These also serve as opportunities that help evaluate products, instruments, and techniques available for the end user. Professionals in different parts of the world may be working on any of these aspects. Periodic meetings of these specialists help identify areas that may be critical or newly emerging in the field.